Werner Herzog (1972) Aguirre, the Wrath of God. Film still. As a child, I remember heading down to the river at the end of the garden with my father. He said that they were making something on the other side of the river and that we should go and have a look. From my memory I can see a cottage with its roof on fire. There are lots of people standing around it watching it burn and for some reason there are lots of big lights, which as a child I thought was the strangest thing as it was the middle of the day. The odd goings-on are in fact a film being made in Ardmore Studios which was on the other side of the river. I think it was a low budget Hammer House, some early 70s rip-off of the Frankenstein story (I was told this much later). Ever since then, I have always had a strong pull to go and see what was on the other side of the river. Deliverance, 1972, directed by John Boorman. 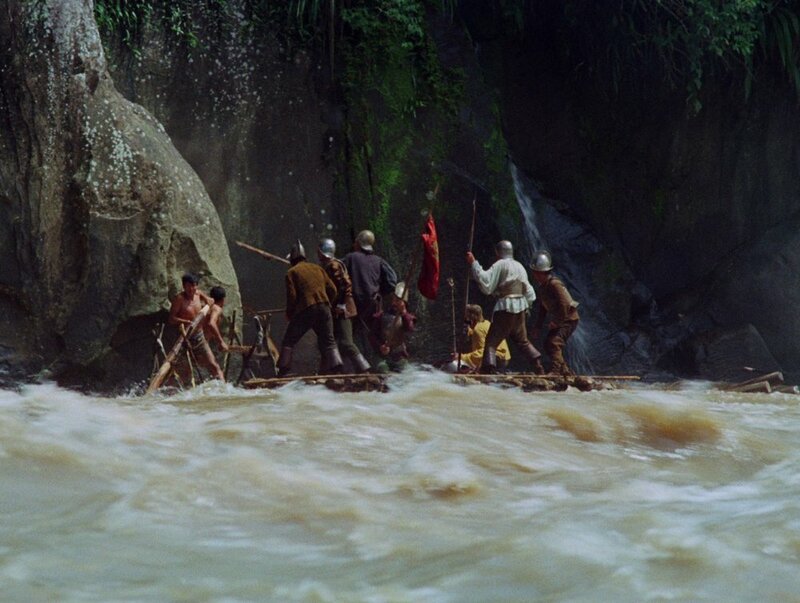 Aguirre, the Wrath of God, 1972, directed by Werner Herzog. Huckleberry Finn and his friends. 1979, Canadian and West German TV series. River's Edge, 1987, directed by Tim Hunter. Deadman, 1995, directed by Jim Jarmusch. To the Waters and the Wild, 1974-94, filmed, written and produced by Gerrit van Gelderen, RTÉ series. Heart of Darkness, 1899, Joseph Conrad. Wind in the Willows, 1908, Kenneth Grahame. Fairport Convention's cover of Ballad of Easy Rider, an out-take on Unhalfbricking, 1969. Primer is a new series of reference lists compiled by artists at the invitation of the Douglas Hyde Gallery on the occasion of their exhibitions. We would like to thank Brendan Earley for his generous contribution.